Moving the discussion here. I'll give some details later - too damn busy! Mod1 controls the morphing - the balanced modulation. Mod2 controls the VCA - the AM gain cell. More details later, I gotta get back to work. Flight, you're well on your way to having a complete synth on offer! Congrats on another awesome design. I'd make those POT arrows little tiny bats or crosses, but that's just me. I like this design tho. You definitely have my favourite designs by far. Make noise comes in second, but far behind yours. 'Bout 8hp like the PB? @ Exuviae: Yup, 8hp. Nice n' skinny. you're making it very hard to stick with just Serge! Maybe a Serge/FoH system? Okay, I need to make this clear though: I did not choose to give up on the frac format. I did not have a choice. They do not sell. Analogue Haven still has more than 25 of the 30 frac Choices from their first Choices stock purchase at the time the module was released, and the frac Plague Bearers have not fared much better. Because of this, AH can not afford to carry them, and I can not afford to produce them. I understand your frustration, believe me. I was a minidisc *zealot* - Pro stereo rack unit, minidisc drive on my computer, two portables, and a freaking sweet head unit in my truck. But me and the 20 others who felt the same as I were not enough to support A) stores to stock the minidisc equipment and cassettes, or B) Sony to keep manufacturing them. Now they are a novelty at best. i haven't given up on minidiscs, flight! i use them to record my practice sessions. I don't understand why Frac users don't just buy the barebones kits. I can respect when Flight says the financial issues make it too difficult to support the format. Just about anyone should be able to put these kits together. I know the panel art is very cool though. This is exactly what I intend to do. The panel art is the only thing I will miss. I completely understand why it has to be this way. Frac seems to be more of a DIY format anyway. 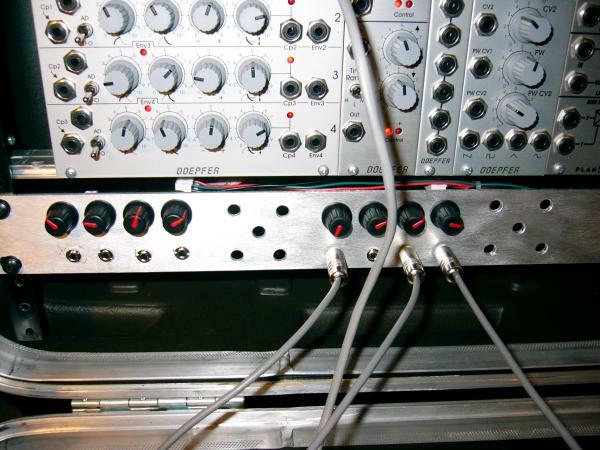 barebones makes flight the Robin Hood of modular synthesis! And here I thought I was a freak with my Frac-format Mini-Disc player! @ johnnymad: Oh, I still use them when I can, just not to the extent I did before. I lost the faceplate to the head unit in my truck, and they've all been discontinued. Minidiscs are harder (and more expensive) to come by as well these days. Also, the software for the minidisc bay on my 'puter is really out-of-date and buggy, and Sony-proprietary so I can't even erase and re-use any of the 400+ discs that I have. Thin metal adhesive Frac panel overlays. I can get them done in Metalphoto, 0.003" thick, with an adhesive backing. They would be black background, but with natural aluminum graphics instead of white. These should be cheap enough to make viable, then all you would need is the Barebones Pack and a piece of aluminum for the base panel. The overlay would be pre-punched, and I would provide a 1:1 scale drill template for the panel. Let me know how that sounds and I'll look into it. The last thing I want to do is get in the way of DIY! That sound's like a very good solution Flight. OK, I'll bite. I have close to zero DIY experience - I have breadboarded some dumb squarewave oscillators and I've done a little soldering. I actually failed at the Blacet DIY cable kit Could I realistically put together a kit for, say, the SoS module? For the record, I have no illusions about the economic reality of doing this stuff for Frac. I emailed Shawn Cleary at AH to ask if he'd be interested in keeping a pre-order list for the SoS. If he's got 25 Choices modules sitting on a shelf, I'm guessing I won't hear back from him. On the other hand, my bitterness over the whole Frac situation is likely to subside now that I FINALLY (as in this week) have tracked down most of the Wiard stuff which led me to choose the format to begin with. I can't go Euro... or I'll never be able to afford to quit my job and actually use this stuff! Stickers, YES!!! I would proudly and with great joy put some lil FoH stickers with my 2 panel mounted PB's. Also the adhesive graphics sticker is a great idea for the DIY crew. I'm all about inexpensive solutions for this kind of thing. The barebones are dead easy. If I can do it, I'm sure you can too. Aluminum is cheap and pretty easy to cut and drill. Plus it's a pretty good feeling that you at least part way made it yourself. Go for it. I emailed Shawn Cleary at AH to ask if he'd be interested in keeping a pre-order list for the SoS. If he's got 25 Choices modules sitting on a shelf, I'm guessing I won't hear back from him. I spoke too soon! Shawn will indeed keep a pre-order list. Email him if you want Frac Sound of Shadows. I'll post more about this soon.